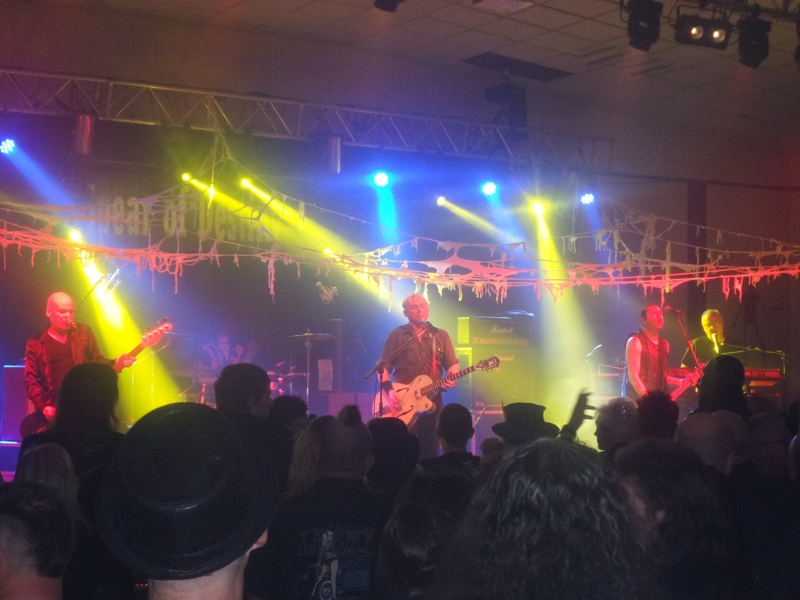 Kirk Brandon’s iconic outfit Spear of Destiny headlined Saturday night at the Spa, the beating black heart of Whitby Goth Weekend. On bass, they had the legendary Craig Adams, member of more bands than you could shake a stick at – the Expelaires, the Cult, the Alabama 3, the Mission, and of course The Sisters of Mercy, which he was part of the first ‘official’ lineup with in 1981. Adams, and the guitarist Wayne Hussey who joined in 1984, would eventually depart the Sisters in 1985 and go on to form The Mission. Before then, however, Adams contributed the bass line to that perennial floor-filler, the song that peaked at #1 in the independent chart in ’83, the song that still appears in the modern Sisters setlist – Temple of Love. So at the penultimate moment of Saturday’s gig, Adams suddenly appears centre stage. In front of him is a tiny, wizened crone clutching a tombstone that says RIP (you can draw your own implications here). The bombastic organ music slows to a halt, there is silence – and then guitars knock out that riff that is instantly recognizable to anyone who has visited a Goth club night in the last thirty years. 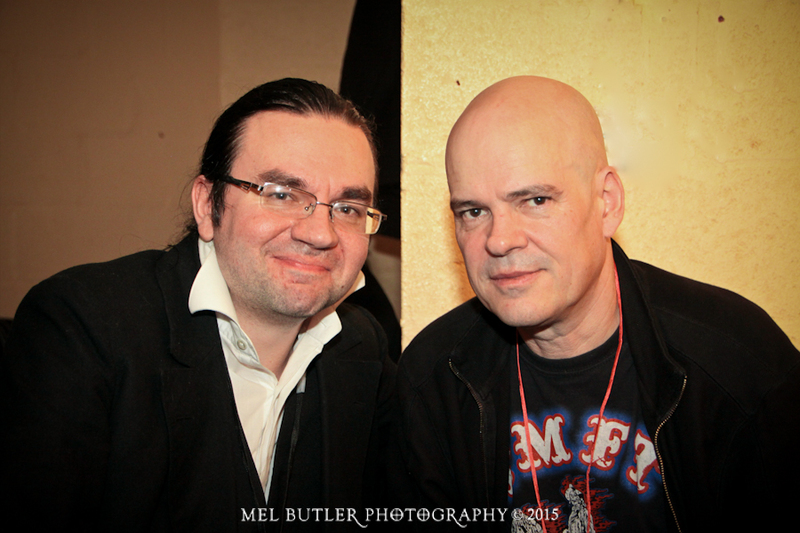 The Blogging Goth: Alright so, I’m sat here with Mr. Craig Adams, veteran bassist currently serving his time with Spear of Destiny. Craig, we’ve just seen you cover Temple of Love, from your old band-mates in The Sisters of Mercy. What on earth made you put that in the set? Craig Adams: (sarcastically) We’re at a Goth festival! Take that, declarations of not being a Goth band! CA: That really is it. We started out saying we could do something funny, sort of… How did it start? The rest of the band, enjoying their rider, shrug. CA: I think we were talking about doing Bela Lugosi, and then we thought, hang on, why don’t we just do Temple of Love instead? We laugh. The guitarist, Adrian Portas, joins in. AP: We do Transmission normally, and we knew that would go down well with this audience, so Kirk sent us the set-list, it wasn’t actually on there, but we play it all the time. So we just said, why not throw it (Temple of Love) in as well? TBG: So, it was just completely off the cuff, just throw it in there? CA: The hardest part was learning the lyrics – I can play the bloody music no problem! TBG: What do you think about the lyrics? Do you find them a bit… Goth to the max? CA: Nah, they’ve obviously great lyrics, but the weird thing is, having never actually sung them before, the phrasing is so bizarre and I’ve never realized how weird he was before. TBG: Do you ever hear from him? CA: (Immediately) We haven’t spoken since 1985. TBG: There you go, of course, I wouldn’t expect otherwise. CA: And I would say, that’s a good place to end that conversation. TBG: In the same vein, Wayne’s going to be here next year – are we gonna see you with him, or is he doing his lone wolf act? CA: I think he is doing a lone wolf thing, that’s all I know. We don’t really know what we’re doing next year, it is going to be busy, it’s our thirtieth anniversary, so we’re gonna do whatever we’re going to do. Some of it is secret, some of it is… We don’t really know what we’re doing! Some bits we do know, some bits we don’t! It’s pretty chaotic, we’re trying to sort it out. It is hard though! TBG: I appreciate that, we do appreciate in advance what we’re gonna get. CA: My wife says I’ve got the mental age of a twelve year old. (To her) Stop saying stuff like that! Right, turn it off, enough! TBG: Craig Adams – thanks very much for your time! 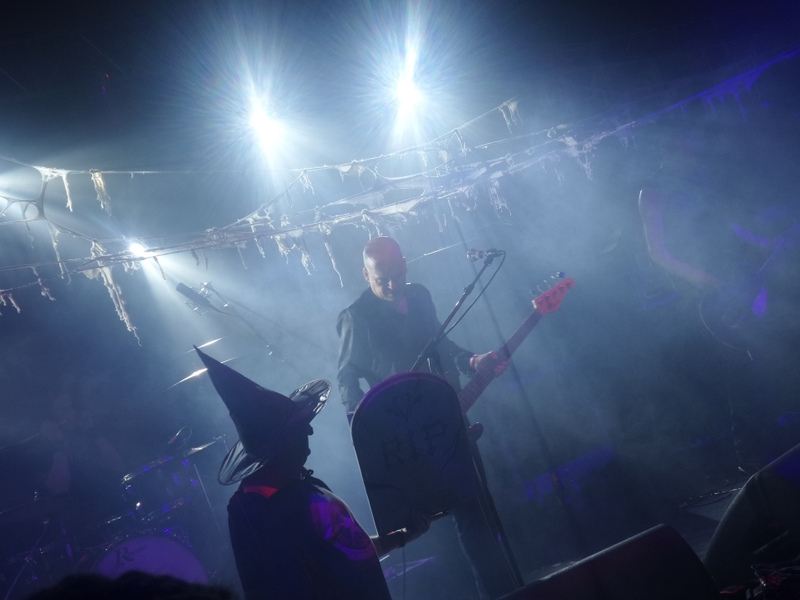 This entry was posted in Uncategorized and tagged bands, festival, goth subculture, interview, links, music, UK Goth Festival, video, Whitby Goth Weekend. Bookmark the permalink.